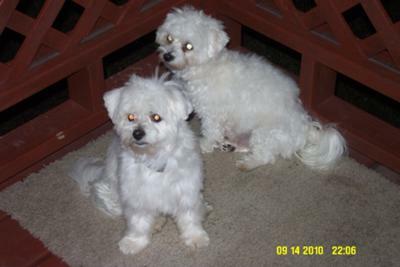 Icee and Ayoki are teacup Maltese puppies and precious little angels. They never bark which is strange. 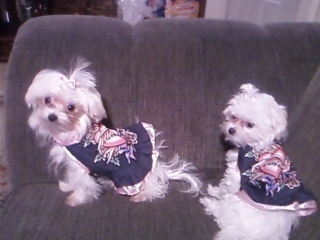 They are spoiled Maltese diva dogs who love to travel and dress up. they are so pretty. where can I find 2 as gorgeous. They may all have white fur and black noses but that is where the similarities end, each have their own manner, personality and attitude that it so obvious to me. 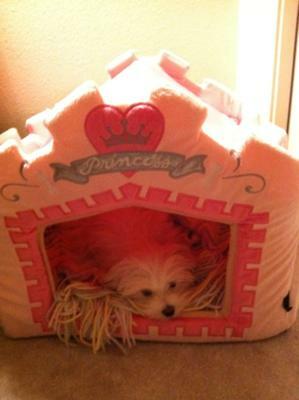 I guess it is like having our own private Maltese puppy joke. boy! anyone with a set of twins could tell you that they look alike but they aren't. 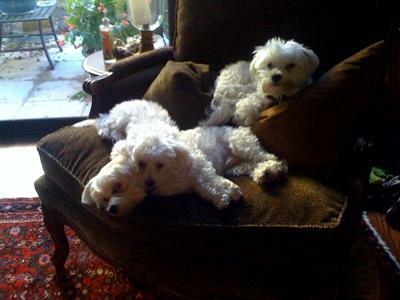 These precious 3 Maltese puppies are the best! me and my wife just love them! Fonzie is a slump of a lump (lazy) love his treats and walks though, Zoe is the princess she likes to be hand fed her food my wife homemakes, she waddles like a lady when she walks doesn't really like big dogs or other dogs at all except her bff Mitsi, our neighbours Pug. Snoopy is the most playful pup of the 3 by far and loves to love and he eats like a little monster, we thought he would be bigger but turns out to be the runt of his litter only about 6 pounds, Fonzie is 13 pounds! Him and Zoe like to play ball all day and of course they love their stuffed animals! 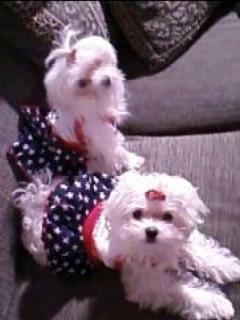 We are a Maltese family. It's been 3wks since we got our Maltese puppy. Lady she immediately adapted to our big odd shaped home and then she just came alive. Running and jumping all around, very picky eater but very lovable to my surprise. She's a joy I must say. See I'm a cat person I've owned more then 15 cats at one time and I never thought that a pup could compare. Well I was wrong. 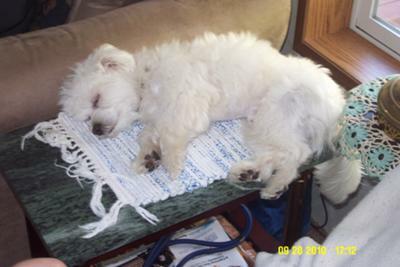 Our Maltese puppy more then compares. She's full of energy playful smart and she knows when she's in trouble. She should have been named Socks my husband says cause she takes them all. Pottying is a problem for us but she definitely knows when she's in the wrong. Cause she runs and hides. I just wish I could get it though to her to potty on the paper not by it. 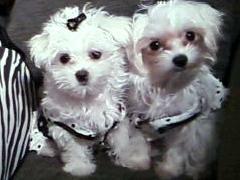 My Maltese puppys my bundle of joy. Even though I stay on poop patrol. 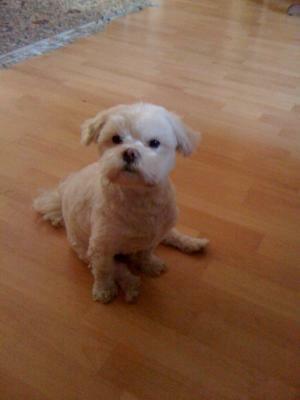 Well ihave to say my shih zhu / maltese is the same . She looks like lady from lady in the tramp . and Soo afectionate and barkative . But try getting a box and putting her 5-10 mins after eating and she'll learn . ( Well thats what iheard from a dog breeder ) Goodluck with Lady ! And Hopefully her training goes well . Peanut was born on August 1, 2006. When I went to get him from the store there were about 6 Maltese puppies running around and Peanut was the only one that ran over to me and had a little flower in his mouth. From then on I knew he was mine forever. Peanut is very talented and sweet. He claps his hands when I sing. My Maltese puppy shakes your hand to say hello. He is very very friendly and loves to snuggle. 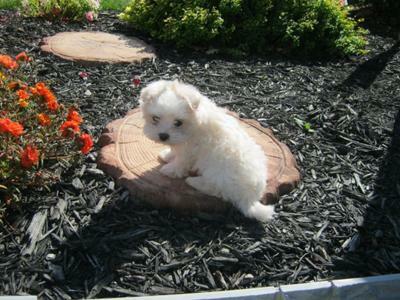 Oh what a cute little puppy, He is the cutest maltese i have ever seen. I love his name too. 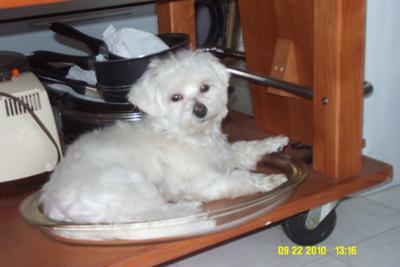 My Maltese puppy is awesome!!! He is extremely lovable and gentle. He loves playing with my 3 children. Our oldest is 11, our daughter is 2, and the baby is 11 months. 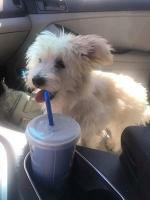 He enjoys going for car rides and loves to run and play! Most of all he loves to play with the kids! Our new Maltese puppy Izabella joined our family two weeks ago. She is 14 weeks old. 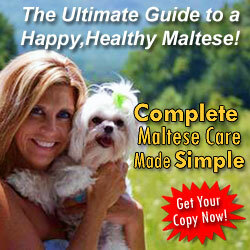 Each day we see more personality form our new Maltese. Izzy is playful and smart, loves to cuddle and very snoopy! We have a 12 year old Yorkie and a 4 year old Yorkie Pom mix and the puppy gets along well with her new family. I have been waiting nine years to get a puppy, but my dad is allergic to dogs. Then we found Maltese Terrier puppies. We looked at information on the breed and searched for suitable breeders. After talking with many breeders and deciding that the breeders did not seem responsible, we looked on 'find a puppy' on the kennel club website. We contacted the recommended breeder and asked questions about the puppy. The puppy was going to cost a lot more money, but it had a lovely temperament, had it's first injections and check up, and was quite a near location. If you are thinking of getting a puppy, a useful website is 'www.croftonline.co.uk/sitepage/new%20puppy.html'. 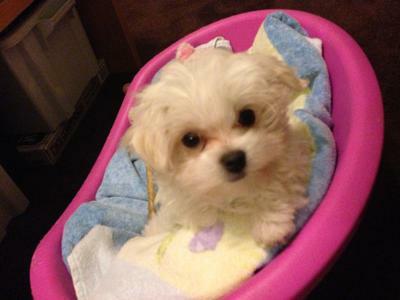 After visiting the breeder and picking up the puppy, Lola the Maltese Terrier puppy came into our lives. She is only 14 weeks old and weighs under half a pound. 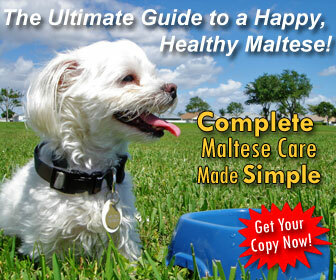 She is a little smaller than average and is very fluffy, as most Maltese are. The breeder said she could make a future show dog so we are thinking about training her for shows. When she sleeps she twists on her back and puts her paws in the air. Every now and then, she goes mad and runs around the room. She loves her toys and squeaks them herself. 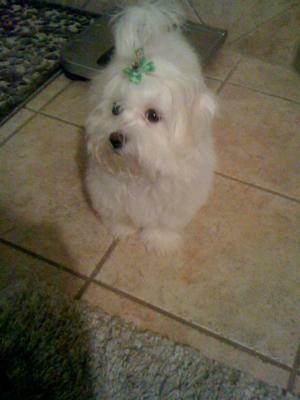 She will make a fine Maltese when she is older. Aww, so cute! My Maltese is called bingo! He squeaks toys himself too! I just got my 5 month old Maltese puppy, Willow a few days ago. She is very sweet and loving, but has separation anxiety. She follows me around everywhere. She is so cute and LOVES to go for car rides. She gets very nervous when you pick her up though and likes to play "Catch me if you can" although I am not sure what that is about. 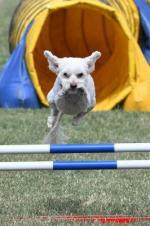 I am excited about the days ahead with my Maltese puppy Willow. 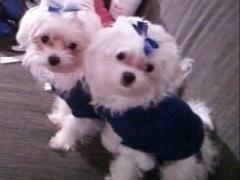 Desi and Lucy will be having Maltese puppies soon. Desi loves to follow me everywhere, even when I cook. He found a safe place to be so I don't step on him. 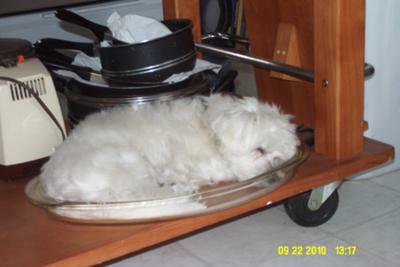 He's love to sit on the bottom of my center island in my pan, as you can see in this picture. I have to put him in a bag when I go in a store. He is a momas boy, if I go some were with out him he cries until I come home. I am so lucky to have him and he doesn't have tear stains like my Havanese does. Lucy will be having their puppies any day now.